For over 30 years, OCCJ has brought together Tulsans of various faiths for the annual Interfaith Trialogue. The series seeks to tackle tough issues in a way that helps us live together with our deepest differences. 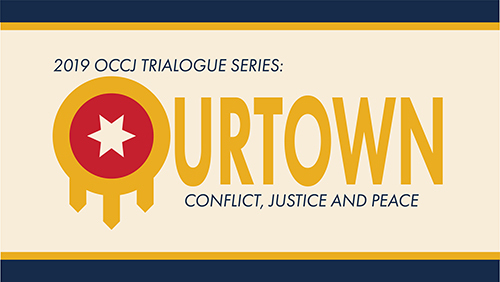 The OCCJ Trialogue Series is made possible in part by the Tulsa Library Trust’s Alfred E. Aaronson Lecture Series Endowment. The Tulsa Library Trust’s Alfred E. Aaronson Lecture Series Endowment was initiated in 1969 on the occasion of Alfred E. Aaronson’s retirement from the Tulsa City-County Library Commission, the Gilcrease Museum Board and the Tulsa Community Relations Commission. Funds collected in his honor were dedicated to bringing authorities to the community to stimulate thought and action in fields where voids exist and offer other points of view. For more information please email info@occjok.org. For decades social change activists have said, “If you want peace, work for justice.” But we also know that working for justice evokes conflict. Working with conflict is particularly difficult in a culture as highly polarized as today’s culture. The 2019 Trialogue series started with a skill-building session for dealing with conflict and bias. The following sessions featured moderated panel conversations, one with elected leaders and another with religious leaders. Each panel addressed matters of conflict, justice and peace in their work.